Hi. I have a deSoto - 46 with a fluiddrive/tiptoe gearbox. My problem is that the gear wont shift from 3 - high. In some point the relay started to make a ticci noise, verry fast. When i removed the wire from the gov´ th on the relay, the noice stoped. I hade also a metalic sound from under the car, when it tryed to shift. Due to my shopmanual, i disconected the wire from the TH on the relay so the freewheeling was of. Then the metalic sound stoped and i could drive like a car with a stick. Then the sound came back annyway. I have also tested the solenoid on the gear and it would not press out the piston when powerd. I pressumed that the reay was to blame and fuond a another oe on e-bay. When i conected that yesterday, well....it also make a ticci sound. But when the engien get up in temp/rpm the sound stopped.? i messured the rpm, it was 600 but i nedd 450 for the car to shift gear, so i turned it down and then the ticci noise was there again.??? Belive me, i was not to happy.But the metalic noice from under the car is gone!! So, is there anyone who can help me with this? Have you checked the oil level in the gearbox? It should be filled with 10W motor oil. The fill plug is on the right side. A good substitute for 10W oil, is Tractor oil, TDH type (Transmission, Differential, Hydraulic) ISO22 or ISO32 grade. The gearbox should shift up, even with the wiring disconnected. Check that the wiring is installed correctly. No frayed wires, bare wires or broke wires, all wires must be connected to the right places. The shop manual should have instructions for testing the gearbox controls. Shift up anyway? How can that be? What´s the governers roll in this shifting?It shifts from 1-2 gear and then it fels like it go directly to 4 when i have the wire disconnected. So there are no wrong with the relay then? And the solenoid? Sounds like a wiring/electrical controls issue. Maybe a grounded wire, wires crossed ect. Could be a faulty relay. Who knows... You need to get the shop manual or look online at the appropriate service films online and learn about these sometimes troublesome transmissions. These transmissions will always upshift with the wiring disconnected and full of oil-even the wrong type. The elecrical system controls when the trans will upshift or downshift. Without the electrics hooked up the trans will just imediately upshift and you won't be able to get it to auto downshift till you comr to a complete stop , hold the clutch in and wait a couple seconds. Then the oil pressure drops so the trans will pull out of high rangs. Thanks c49er. Well i have same wireing to do then.Was thinking of replace same of the old and dry ones anyway. Just is no fun to buy a new and expencive relay, just to find it making the same noice as the old one.Is there same way to check out the relay when its dissconected?One q;so its possible to drive the car like regulary with out the autotrans funktion on?No harm to the gearbox? You said "sometimes troublesome trans..." Well i have been looking in the Master tech.service thats on this sight. Its seems to be a complex system of electric, rpm, speed, mechanic and pneumatic preesure gear system that crysler built.Looks like hightech at the time..but fragile? Same one having a simple 3gear manual leftover? Mats, The M-5 transmission works fine normally. But as an old M-5 transmission owner you will need to know how it works and how to maintain/repair it. Otherwise get to know someone who can keep it working properly. They normally work fine but I have read so many of the same stories my transmission will not upshift, grinds/bangs into high ect that I always tell the new DeSoto/Chrysler owners thy need to learn for themselves about the operation of the M-5 and M-6 (1949-53) hydraulic transmissions. Not many guys left today who know much about them! They are gone! Fix the problem and use it as was designed. Re-wire it properly and put 10 weight in the trans. Your relay might be buzzing clicking because of crossed shorted wires. The cover can be removed from the relay but you need to know what to look for and understand how the relay works electrically too. Okey Bob. You are right about that there no one left who can keep it in shape, so to be my one expert is what its take. I learn to do a carburator tune-up tanks to the Shopmanual, so way not the same with the trans. Thanks for the support on this q. Looks like a god site to visit for trouble shooting q:s.
The Fluid Drive and M6 transmission is the simplest and most rugged of the early attempts at automatic transmission. It is usually trouble free. Most common faults can be repaired easily and cheaply. Bad wiring, low on oil, these are the most common faults. There has been a lot of discussion on driving and maintaining these transmissions. If you go to the Chrysler section and do a search for Fluid Drive you will find many threads. There were some long ones in 2008 that are very informative. *** When you say relay do you mean the small box under the hood? That is not a relay. It contains a resistor and a circuit breaker. If it is ticking it must be the circuit breaker cycling on and off - this indicates a short circuit in the wiring. Suggest you inspect for bare wires, broken wires, missing insulation, or wires rubbing against the body. Secret of the M6 transmission. It is a conventional gearbox that shifts itself. Instead of the driver shifting a lever from 3 to 4 gear, a hydraulic piston does the work. There is a little pump in the back of the transmission for pressure. There is a solenoid valve to release the pressure. There is a governor to make it shift at the right speed. There is an interrupter switch to control the shift. There is a gearshift lever. The driver can select HIGH RANGE. the transmission will shift from 3 to 4 and back. Or the driver can select LOW RANGE. The transmission will shift from 1 to 2 and back. Or the drive can select REVERSE gear. Normally all driving is done in HIGH RANGE. LOW RANGE only for driving in deep snow, mud or sand. 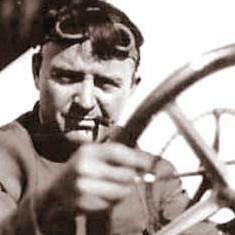 Starting on a steep hill or driving slowly.
" When you say relay do you mean the small box under the hood? That is not a relay. It contains a resistor and a circuit breaker"
Rusty, the resistor and circuit breaker box mounted on the air cleaner bracket-6 cylinder cars is only for 1949-53 M-6 cars. 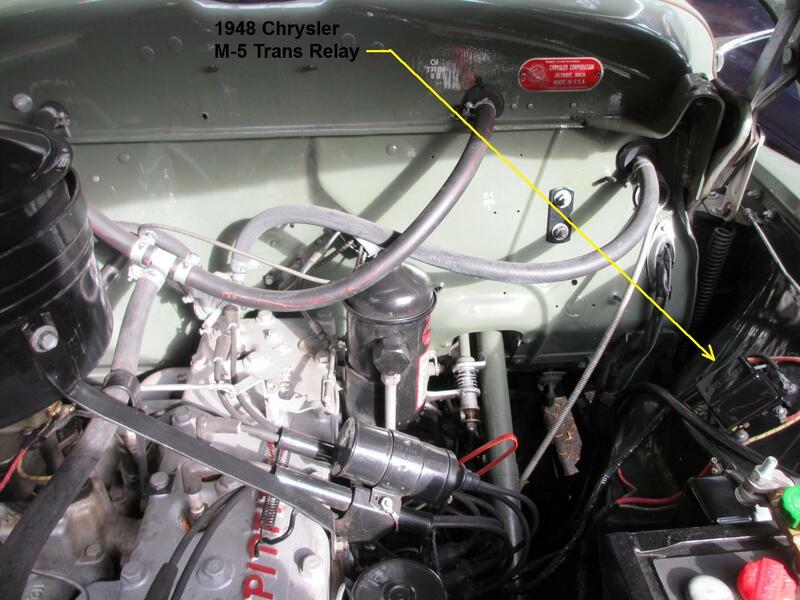 1946-48 M-5 type cars actually do have a 5 terminal relay box with a fuse attached and it is mounted generally on the drivers side inner fender panel. That is what mats is refering to. Picture of a 1948 M-5 relay. 1946-46 DeSoto and Chrysler all the same. Why would the relay rapidly tick on and off? Still suggests faulty wiring or a short circuit to me, what do you think would cause this? I agree with you Rusty. Hi. Thanks agin. Another q about the solenoid. My has the marks;7A 6v DC sss4002 Electric Auto lite co Toledo Ohio. When replace it, what is 7A standing for and does it matter if a new one have ec.12B and the rest is the same? 7A 6v DC - I think this means, 7 amperes 6 volts direct current. 7 amps being the current draw, 6 volts DC being the operating voltage and power system. I could be wrong, especially if the other one has 12B in place of 7A. I would not replace the relay without checking out a few things. What is happening, and this happens to starter solenoids, is what when battery voltage is supplied to the relay it pulls in supplying power to the circult. The battery is unable to supply the power. So the battery voltage drops below the hold-in voltage of the relay and the relay opens removing power from the circult. The battery voltage then rises above the pull-in voltage of the relay and the cycle starts over again. You need to use voltmeter to see what voltage is being supplied to the relay. 1 engine off, 2 egnition on and 3 engine running. My battery hade 6.2v. In no.1 test 4 off 5 terminals hade the same v. Int.terminal hade 4.04v. In test 2 the v. droped on Int. to 3.94v. and the Pri.terminal drops to 0,24v. In test 3 the Bat.terminal drop to 2,8v , Pri.terminal to 0.15v, Int. to 2,8v, and the TH. to 2,8v. The only terminal that hade the same v in the tests was to Solenoid.One thing in this wiring circuit is the Pri. wire. It has 2 groundet points.1 is on the realy and 2 is at the ignition coil end. I tested the volt on the second end and it was 6.2? Is there anything wrong in this tests? Rusty; what you said about the solenoid seems to be logic. But i found a nother one whit 9c so before i buy i new one i have to be sure. Your tests are good. The problem is that the voltage on the Battery (BAT) terminal is only 2.8 volts. It should be what battery voltage is which is 6 volts. You need to trace the wires to find out what happened to the voltage. This wiring diagram is for a 1940 - 1948 Chrysler, but it should be similar to your Desoto. ok, that narrows it down a bit.Thanks.The wiring diagram looks like the one in my shop manual so i will dig in to it. There is a lot of good information on this Chrysler Imperial Club web site. There is a lot more information on your transmission in the Technical section. Thank you Rusty, i will do just that. I was in the garage today and started to ree-wiring from the trans to the relay. Wow. There was some nasty conections, they hade just "twist together" the wire from TH on relay to the guvernor with the wire to the kickdown on the carburator.The same with the wire from solenoid on the trans to the magnetic dashpot on the carb. This could be the why ther is a volt dropi n the system.So, your advice about the electric wiring seems to be just righ. I will also change the wires from Bat and Int on relay to ignision coil and ree-wiring from carb to relay, that is dashpot and kickdown.Feels good to have that done. When you see wiring like that it is hard to blame the car for not working correctly. Bad wiring and low oil account for 90% of the problems with these transmissions, both are easy and cheap to fix. Be careful to route the wiring so it will not touch the hot exhaust pipe or rub against the engine, even when the car is running. Do you know there is an access plate under the carpet, that is right above the transmission controls? Makes it easy to work on the controls and wiring from above. More good advice, i thank you for that. Yes i know about the access plate, i toke the hole floor away, like i did when we cange the master brake cylinder. Of course i tryed to do it with the floor on first....hmm.. And yes i hope that this will make the gear shift nice and keep the relay quiet. next thing is to trac down some TDH iso 32 oil and i have good hopes for that. I am thinking of flushing the trans with fotogen first? The TDH oil is for tractors, Transmission Differential Hydraulic oil. ISO22 or ISO32 grade. Here we buy it at auto parts stores or farm supply stores. It is not expensive, about $10 for 4 litres. You should not need to flush the transmission. Drain and refill every 10,000 miles. Fluid Drive unit does not need to be drained, just checked every 10,000 miles and topped up if necessary. It does no harm if it is a little low, the FD will continue to work with only half the recommended fluid. Q about the oil, is it mineral, parafin, syntetic? Its cost a litle bit more here, around 15dollar per liter. i found some iso vg32,is that the correct oil?